Due to life events, this post comes a WEEK after the actual game. My brother Ashley and I have pretty much got a lock on Sunday WFB gaming at our local store, so we are able to really plan in advance what we want to play. 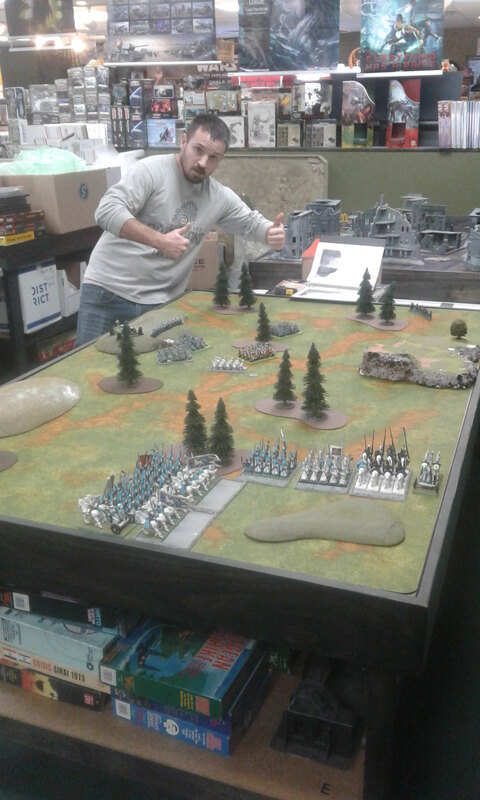 Given that we've recently acquired a solid base of a Dwarf army, Ashley decided he was choosing the scenario, the armies, AND the points values. The fun part? We'd roll randomly for who got what army. 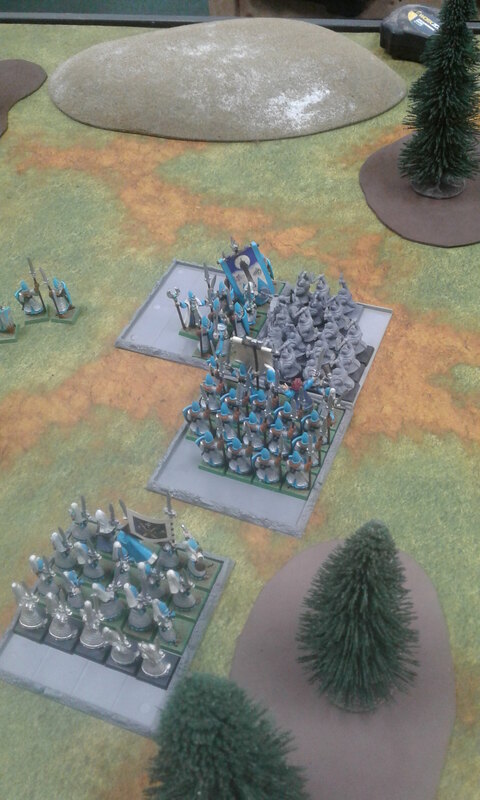 The scenario he had picked revolved around an uneven match up, since we don't have a full 2,000 of Dwarfs yet. His choice? Rearguard, otherwise known as The Fall of Chaqua. Deployment is in corners, ala Cleanse for 3rd Ed. 40K, and the goal is for the Attacker to get as many units off the Defender's table edges as possible before the game randomly ends. The Attacker has twice the points of the Defender. As an added bonus, the Defender is Immune to Panic. This basically means I'm facing an army of Longbeards. And I roll... the High Elves. I get to be the Attacker with a list that contains some units I'm not really keen on running. I noticed pretty quick that he had the Dwarfs 6.5 book, but as he wasn't running anything that I had an issue with, we just kept it going. 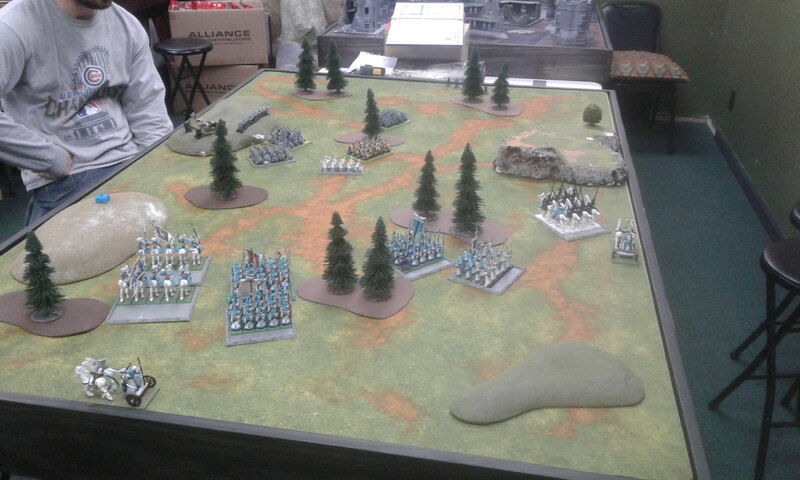 As you can see, terrain hampered High Elf deployment, but I was given a nice stretch to scout my Shadow Warriors to that would lead pretty much to an immediate board edge claim. I rolled for spells, choosing the Lore of Shadows for the Mage with the Silver Wand and the Lore of Life for the other Mage. Through stellar rolling and some swapping, I wound up with Father of Thorns and Rain Lord for Life, and Steed of Shadows, Creeping Death, and Unseen Lurker. As is the case with most Attacker/Defender scenarios, the Attacker goes first. Every unit on the board moves out of the Deployment Zone at top speed, allowing for maneuvers. 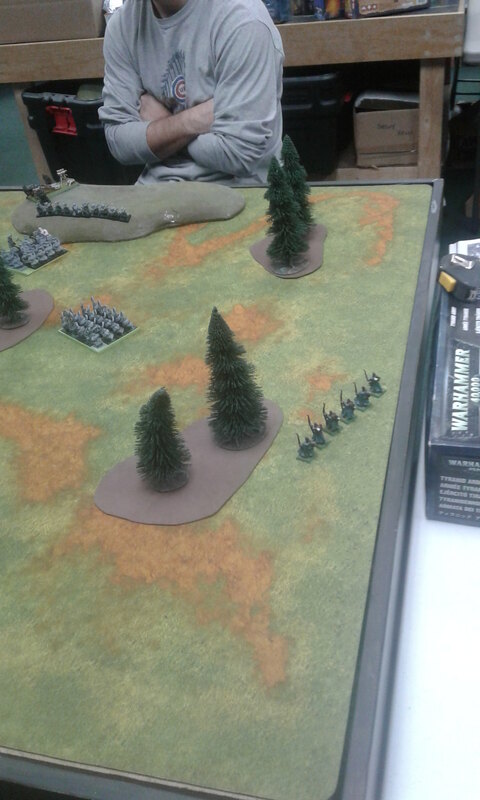 The Shadow Warriors move out into the open on a direct course for the Dwarf short table edge. Ashley immediately asked me why I wasn't marching with my Chariots. He then learned the sad fact that Chariots cannot march, which is one of many reasons why I stopped taking them. Steed of Shadows is easily dispelled, and Creeping Death was failed to cast. The Ring of Corin, however, went off and only accounted for 3 Slayers. 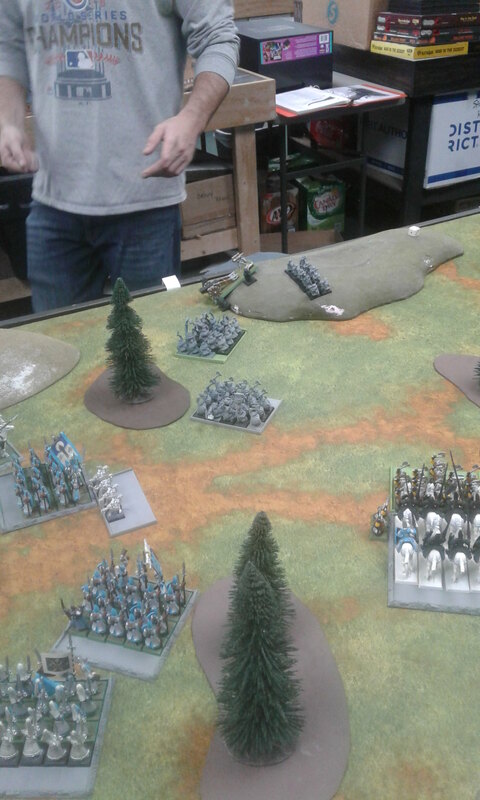 With the exception of the Thunderers reforming and the Cannon moving 3" to block any attempt at the tip of the long board edge, all Dwarfs moved forward at top speed. The Silver Helms declare the lone charge this turn against the Warriors directly in front of them, with the Warriors holding in response. 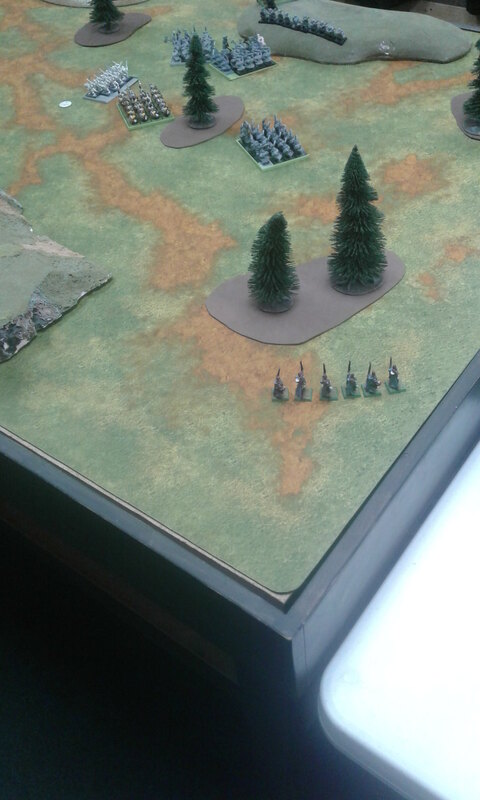 The Shadow Warriors left the table on the short board edge. All other units either moved forward at top speed or repositioned to support any charges or navigate terrain. Two more Slayers fall to Father Of Thorns in the Magic Phase, while 1 Warrior falls to Creeping Death. POM is dispelled, as is the Ring of Corin. Neither Reaver unit can manage to wound any of the Cannon crew in the Shooting Phase, and the Chariot beside the Silver Helms fails to hit the Miners. Combat saw NEITHER side able to land a single blow. Combat resolution went to the Dwarfs. Silver Helms easily pass, and the Dwarfs lap around. 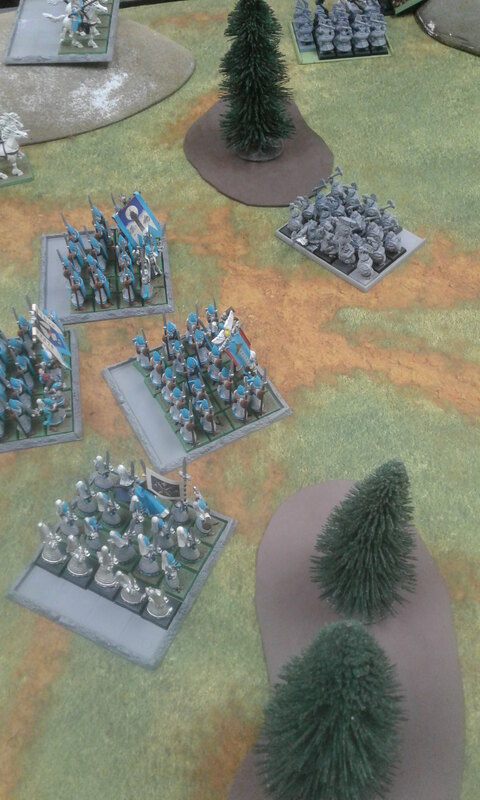 The Slayers declare a charge on the closest Spearmen regiment, who hold in response. All Dwarf ballistic units hold firm while all combat units move forward at maximum speed. 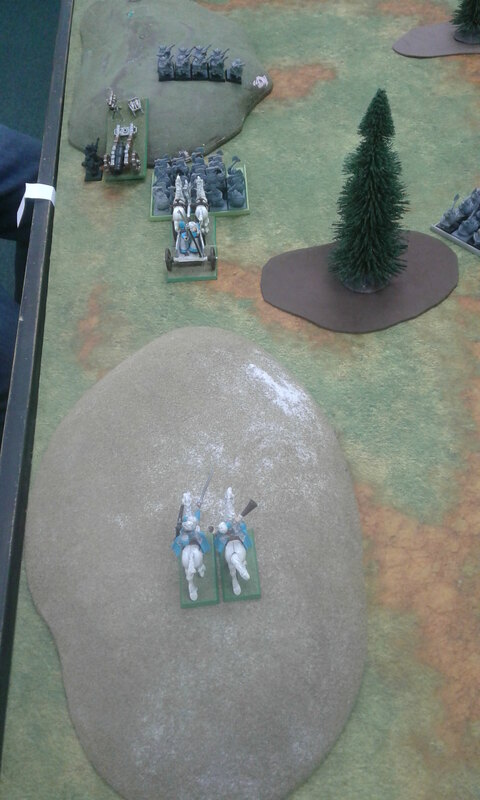 In the Shooting Phase the Thunderers drop 3 Reavers on the hill, while the Cannon dispatches a fourth. Panic test is passed. In the Close Combat Phase the Silver Helms land 1 wound on the Warriors, who pass their Armor Save. 2 Silver Helms die in return. The Silver Helms break and flee10", with the Warriors passing their restrain test. The Slayers pull down a Spearmen, while no wounds are done in return. While the Spears win the combat, Unbreakable guarantees that nobody is going anywhere. All panic checks passed, time to move on. 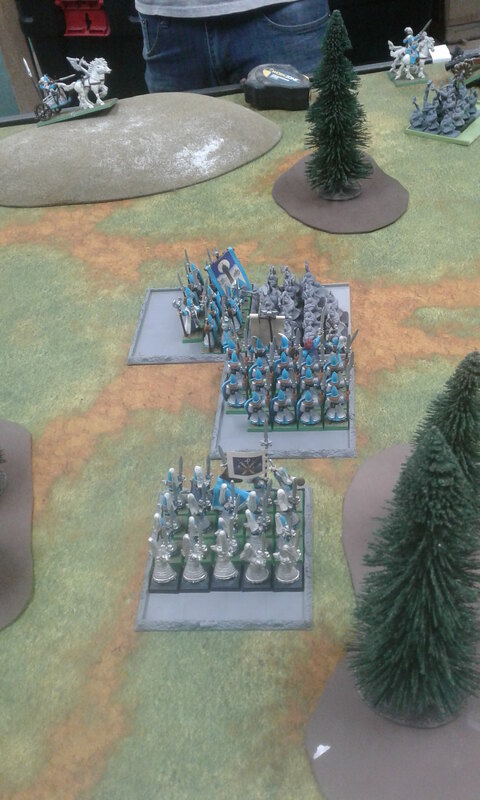 The Chariot declares a charge on the Warrior unit that saw off the Silver Helms, the lone Reaver charges the Cannon crew, and the Battle Standard Bearer's Spearman regiment charges the Slayers in the flank. 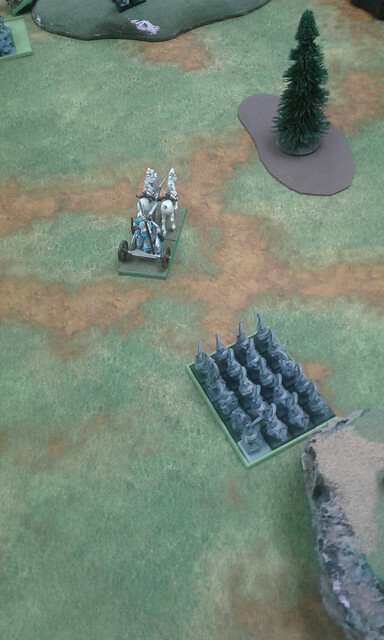 The Silver Helms martial their courage and... flee off the damn table. Of course they do. All other units move into position as there are now several choke points in the middle of the board. Steed of Shadows is the only spell that can be cast at the beginning of my Magic Phase, and the whole rest of the Magic Phase depends on it getting off. Naturally, Ashley throws all his dice at it. Magic Phase ends. The unengaged Chariot fires on an unengaged unit of Warriors, but fails to wound. 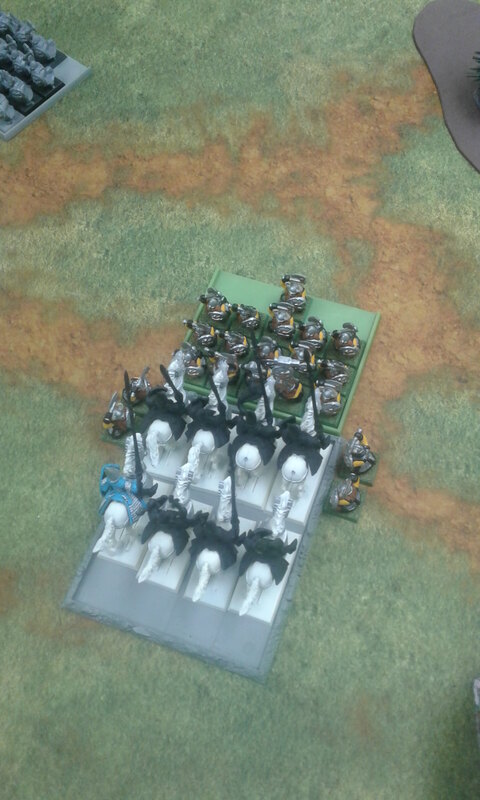 The unengaged Reaver unit fells one Thunderer. Now to Close Combat. 4 Warriors die to Impact Hits, and 1 more is felled by the crew. 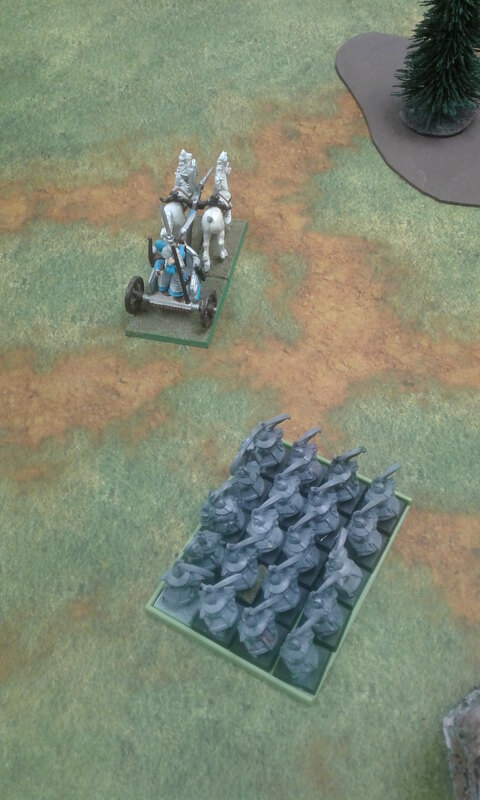 No attacks back, but the Chariot loses due to Combat Resolution. They pass their break check, and 1 model laps around the side. You read that right: 1 model. 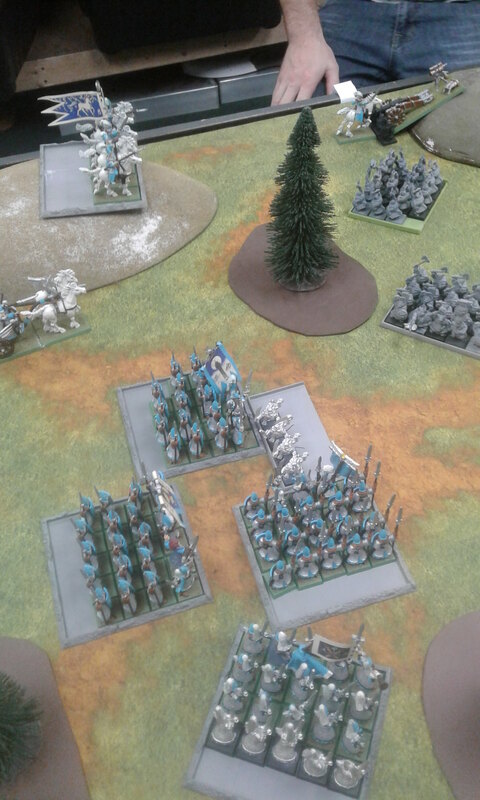 The Spearmen regiments wipe out the Slayers and reform facing the fresh Dwarf units. 1 Cannon crew member dies to the Reaver charge. Combat is a draw. 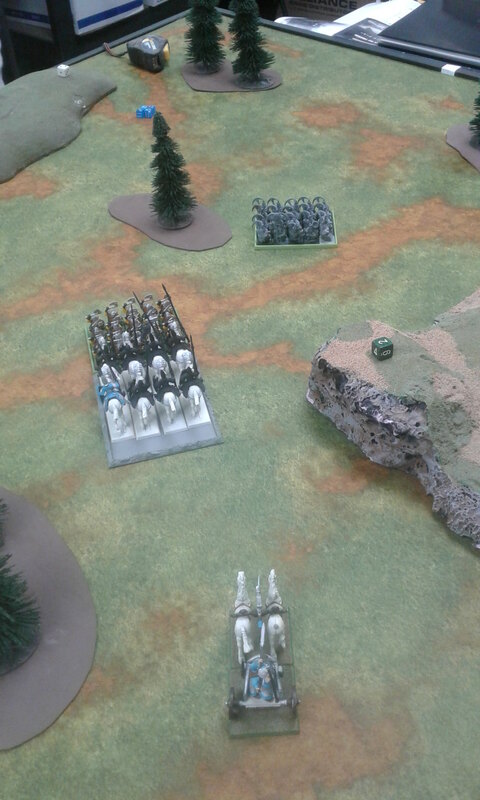 The Warriors closest to the Cannon flank the lone Reaver, and the Miners flank the Chariot. BOTH pass their Panic check. 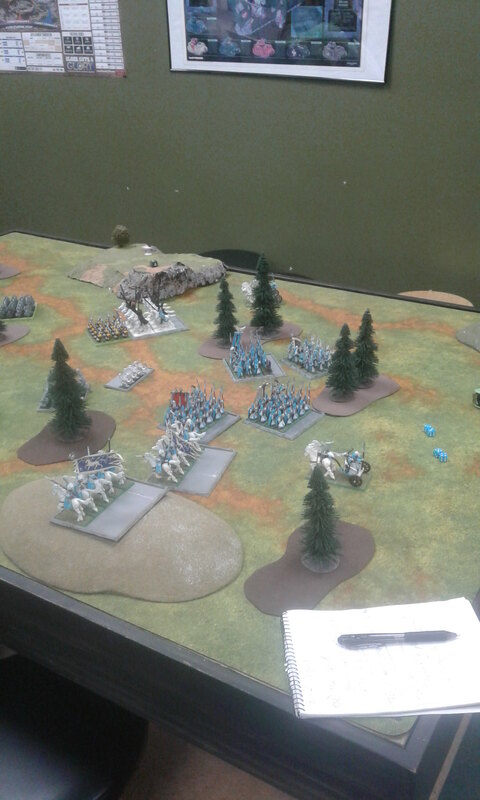 The unengaged Warrior unit moves forward towards the BSB's Spearmen. Thunderers stand. 3 Reavers on the hill die to Thunderer shots, and then promptly panic 6" away. In the Close Combat Phase NOBODY lands a single unsaved wound in the Chariot/Miners/Warriors combat. 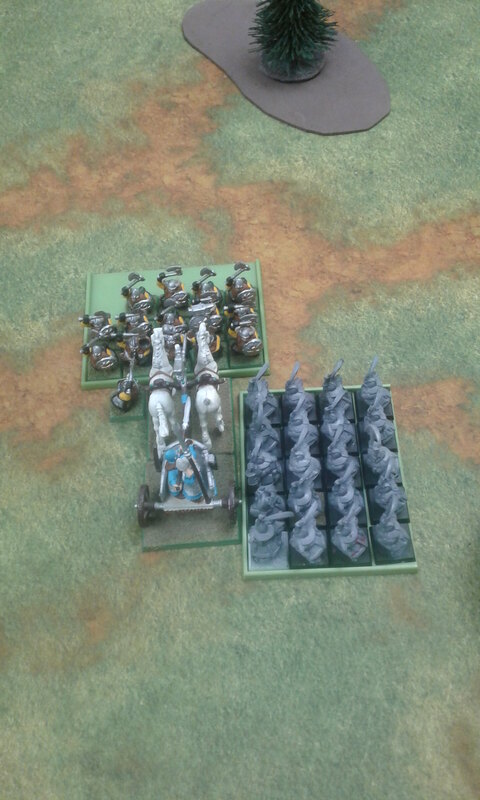 Chariot breaks and flees 12", Warriors pursue 4", Miners restrain. The lone Reaver falls before a single blow can be landed, and the Warriors responsible reform in anticipation of the next wave of Elves. 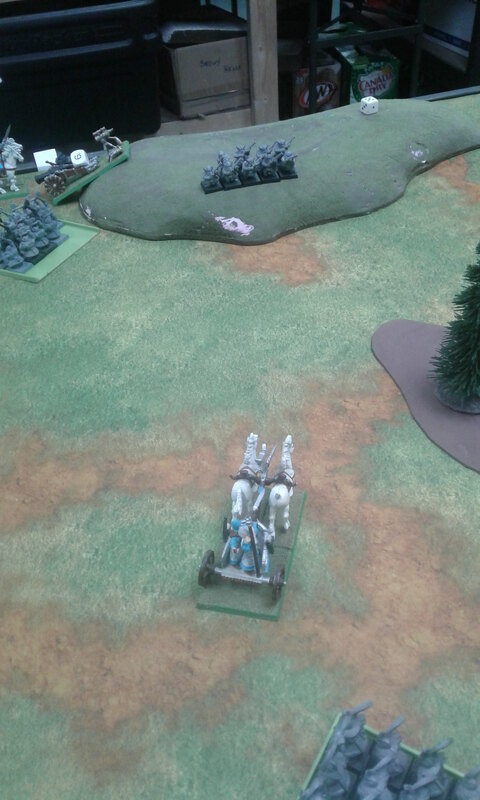 The Chariot near the Cannon charges the Warrior regiment that had seen off the Reavers. 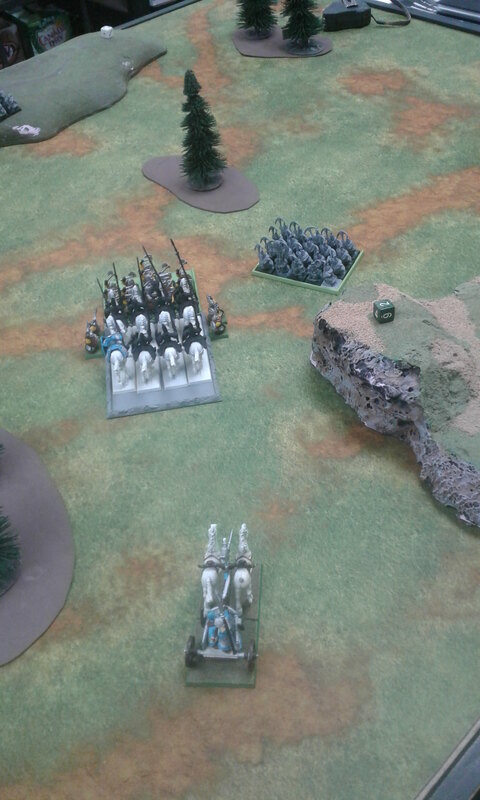 The BSB's Spearmen charge the Thane's Warriors. 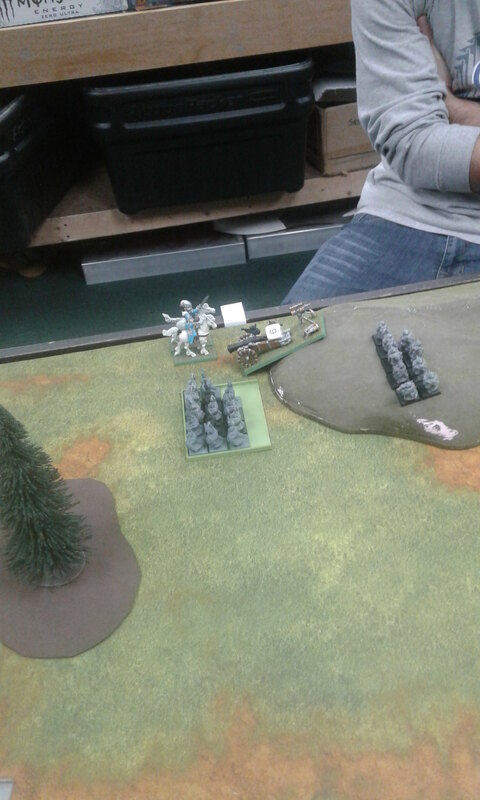 The Reavers and fleeing Chariot both rally. All other unengaged units reposition. In the Magic Phase 1 Warrior from the unengaged unit falls to Father of Thorns. Creeping Death is failed, Ring of Corin and Pelt of Midnight both dispelled. 3 Warriors die to Impact Hits, 1 more falls to a crewmember. Chariot loses combat by 1, passes its break test, and is lapped for its troubles. The Thane issues a challenge knowing that I have NOBODY to take it instead of my BSB, AND that I'm dependent on that magic banner going off. CHALLENGE ACCEPTED!!!!!!!!!!!!! The BSB fails to wound the Thane, and is wounded once in return. No Warriors die, but 1 Spearman falls. I roll a 3 for the Battle Banner. Dwarfs pass their Break test and I lap around. The unengaged units all reposition. In the Shooting Phase the Cannon targets the Reavers and... MISFIRES!!!!!!!!! It loses two turns to clear the cannon to fire again. 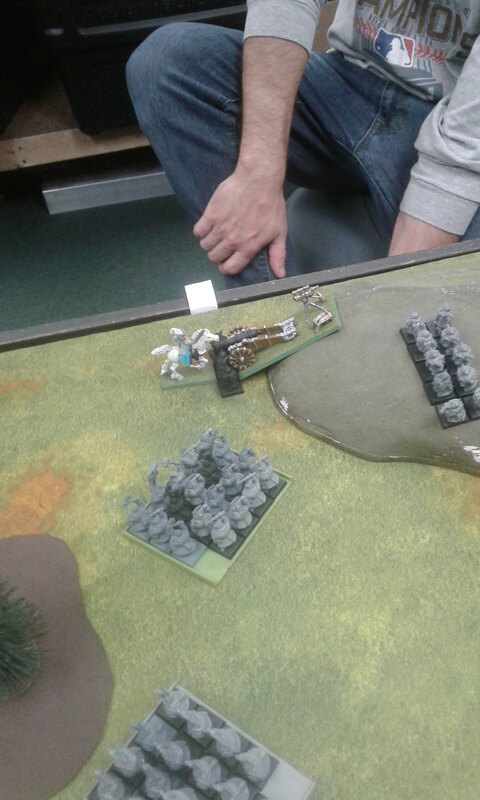 1 Warrior dies to the Chariot, with no wounds in return, then promptly flees 15" from a failed Break test. Warriors past test to restrain. BSB whiffs all attacks, Thane manages 1 wound, which is all the BSB has left. CHALLENGE OVER!!!!! Spears fail to wound, and 1 dies in return. 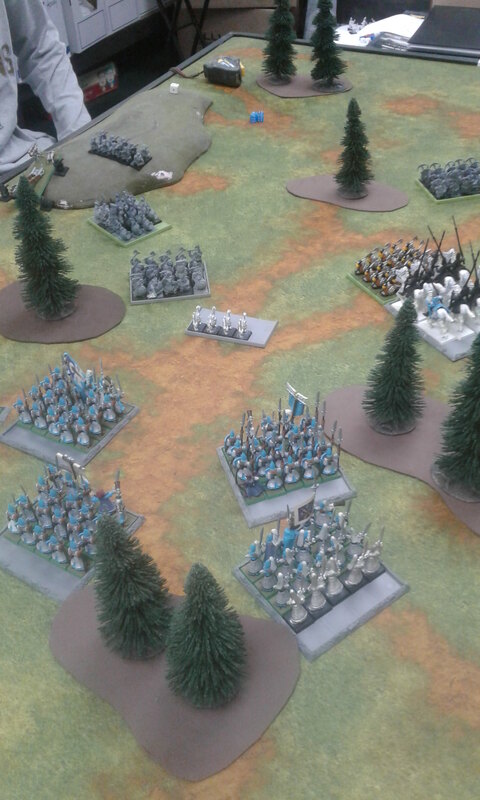 Breaking from combat the Spearmen flee 6", and the Dwarfs pursue 7". Gone. Pursuit into fresh Spearmen. 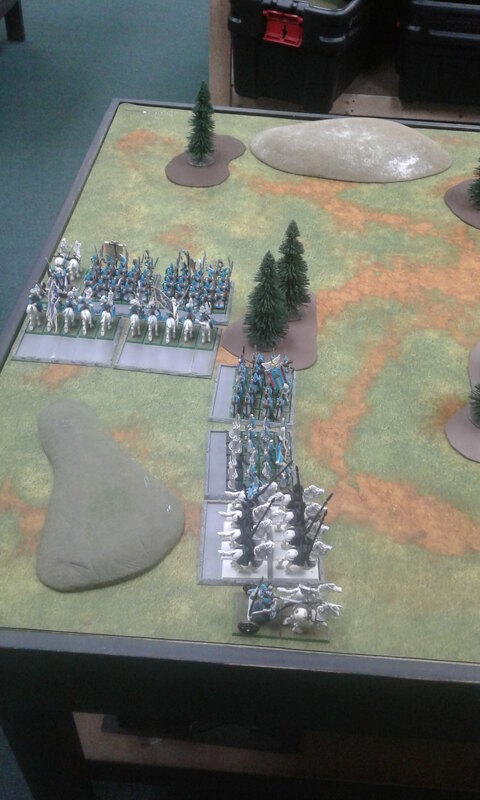 The Spearmen nearest the Thane's Warriors charge the flank of that regiment. 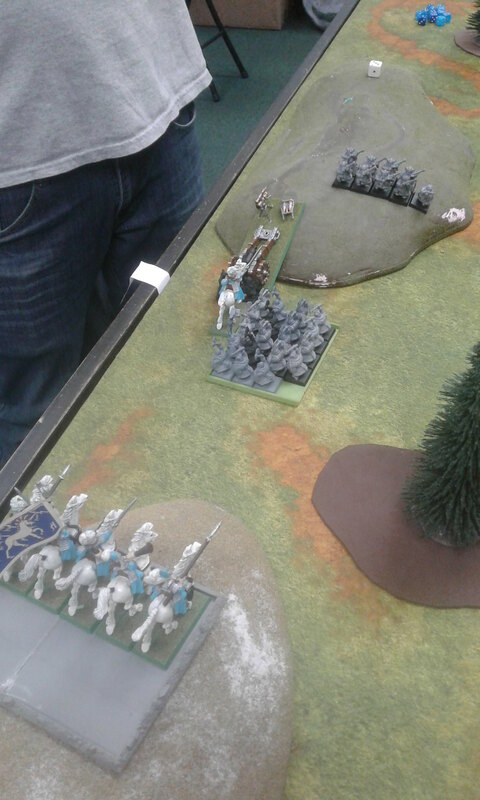 The Chariot in the center of the board charges the Warriors next to the Miners, who flee in response. 3". Bye bye Warriors. Steed of Shadows is dispelled. Easily. CHALLENGE!!!!!!!!!! The Thane points to the Mage holding the Silver Wand and commands his presence. The Mage mutters "Yeah, right..." and proceeds to the back of the unit. 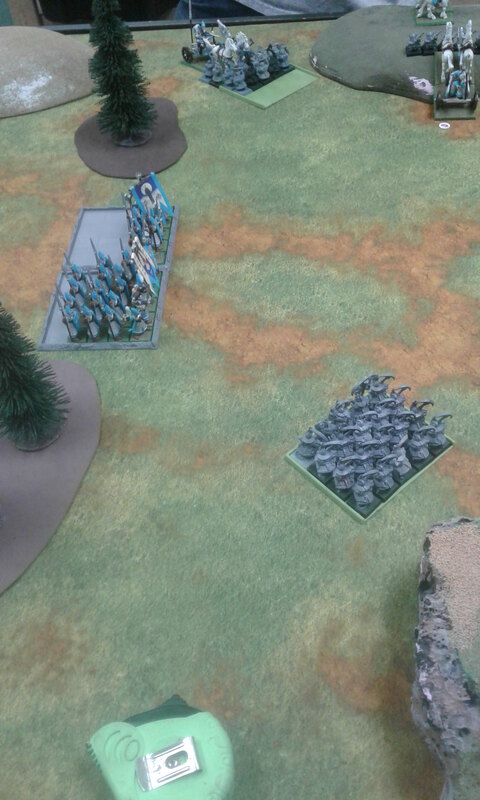 The flanking Spearmen manage to wound NOBODY, while one dies in response. 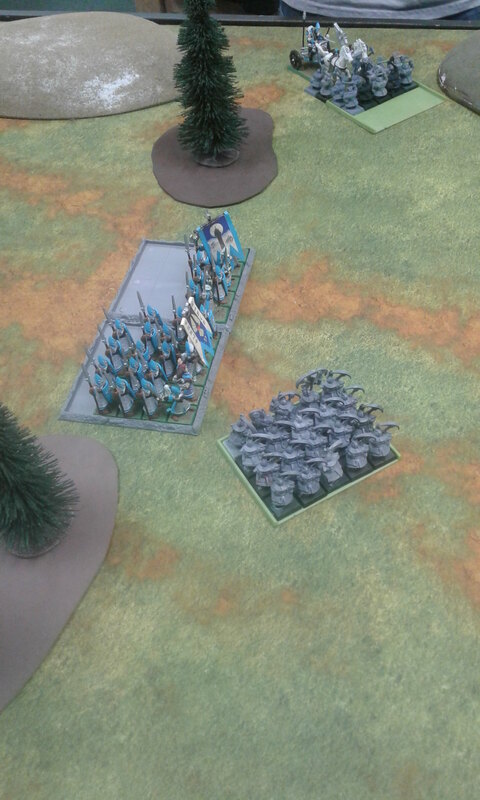 The Spearmen engaged to the front lose 5 to the charging Dwarfs, and send 1 to the grave in response. Impossibly, the results add up to a draw. 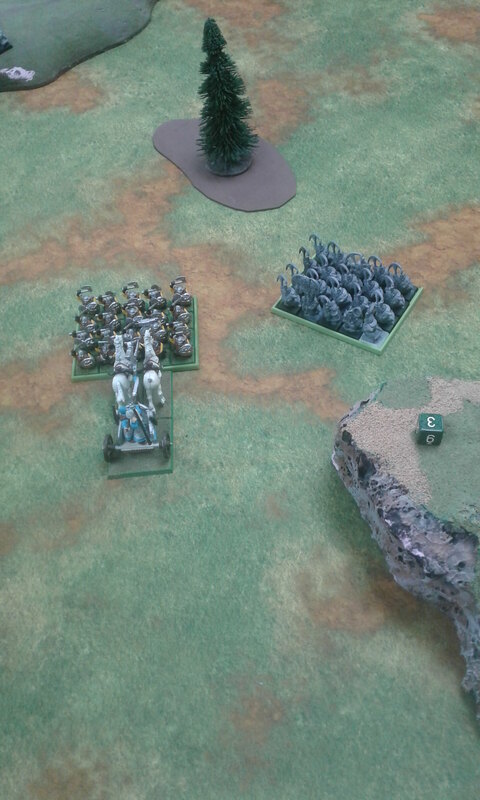 3 Warriors are wound between the two Spearmen units in combat with them, INCLUDING having a flank, and all 3 are saved. 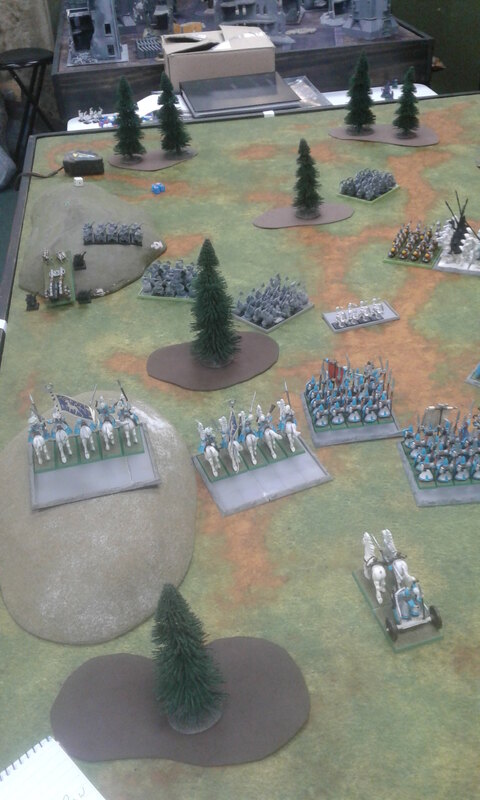 3 from the front Spearmen regiment die, and the Warriors pass their Break test again. If the game were to end here, I would win per the scenario victory conditions. Unsurprisingly I do NOT roll to end the game. 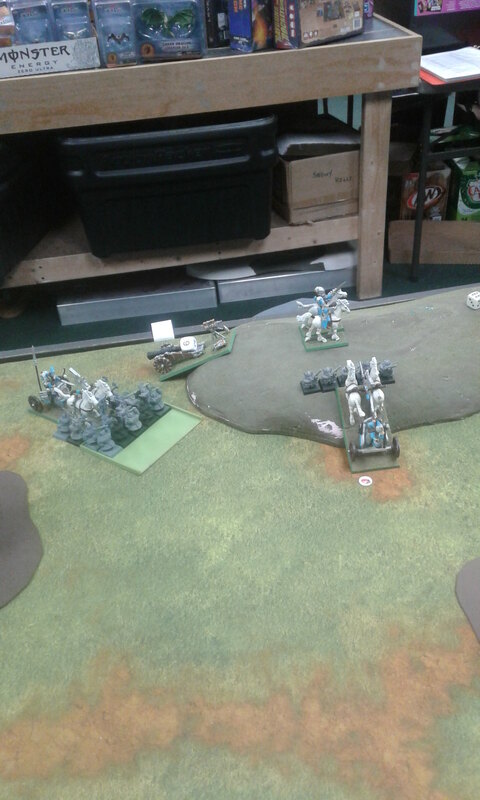 The Chariot facing the Thunderers charges, and takes 1 wound from Stand and Shoot. 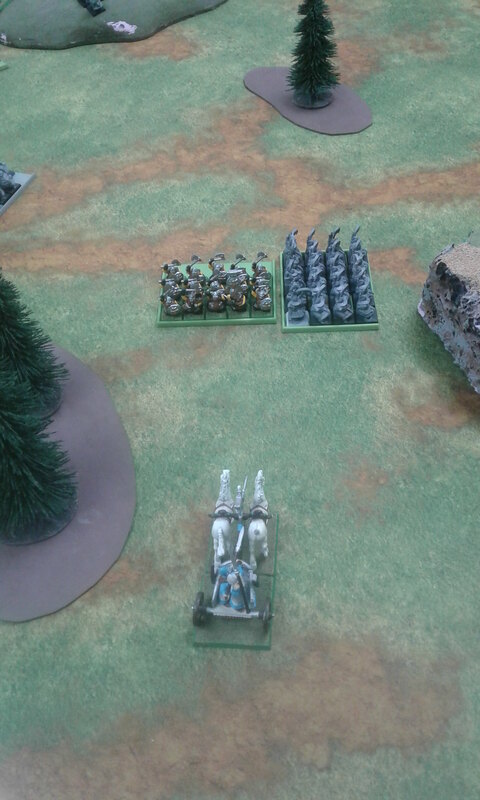 The Second Chariot charges into the Warriors by the Cannon, and the Reavers charge the Cannon crew. Steed of Shadows is dispelled. Again. 2 Thunderers fall to Impact Hits and 2 fall to attacks. None are done in return, but they pass their Break test. 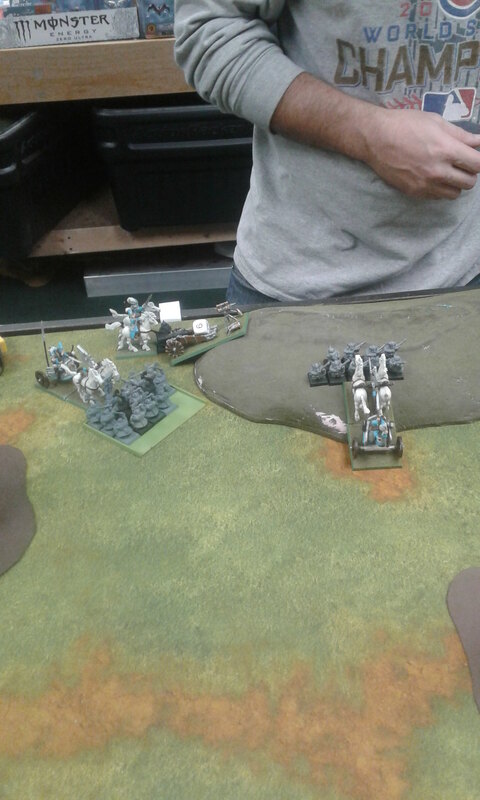 Reavers wipe out the Cannon crew and overrun 9"
The Chariot charging the Warriors causes 2 Impact Hits, which are saved. BOTH units fail with their normal attacks. The Chariot passes its Break Test, and the Warriors lap around. The challenge is again refused. 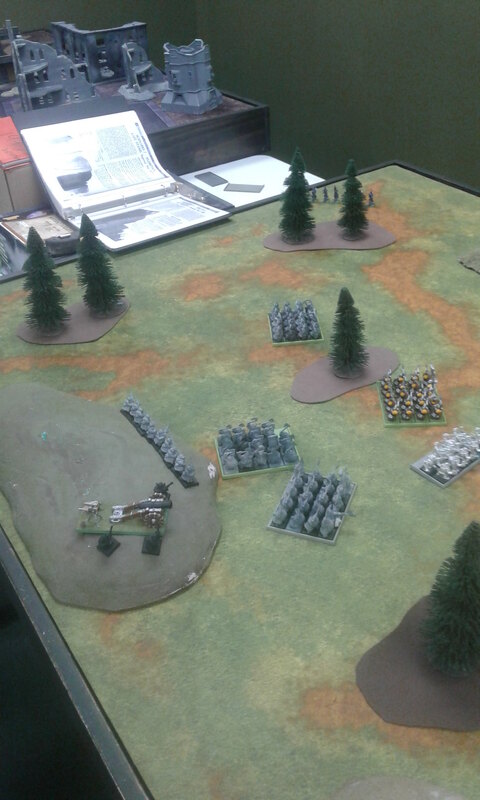 3 Warriors die to combined attacks, with 2 Elves dying in the front unit. 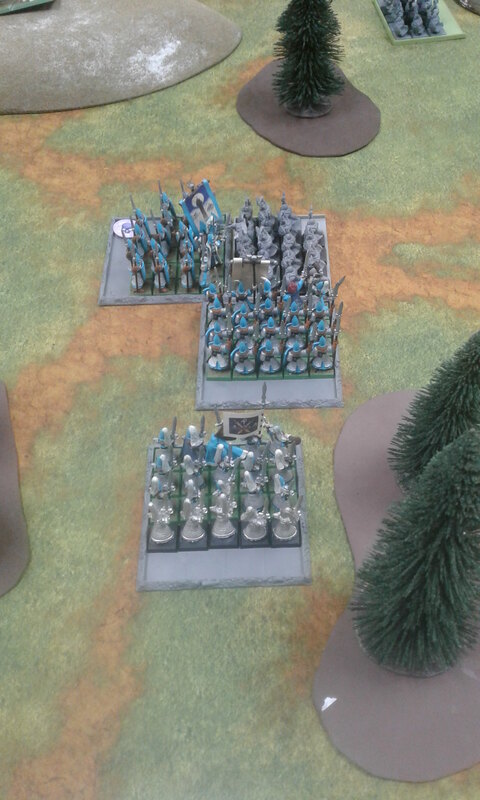 Warriors break 2:, and both the Spearmen regiments roll 7" pursuit rolls. The Miners move 6" towards the closest unit. 1 Thunderer dies, but does no wounds back. Drawn combat. Chariot 2 whiffs all its attacks, and gets 2 wounds taken of in return. It promptly flees 18" off the table with the Warriors pursuing 9" off the table as well. And HERE is where I roll to end the game. Unfortunately I did not have enough units off the correct table edges to satisfy the victory conditions. 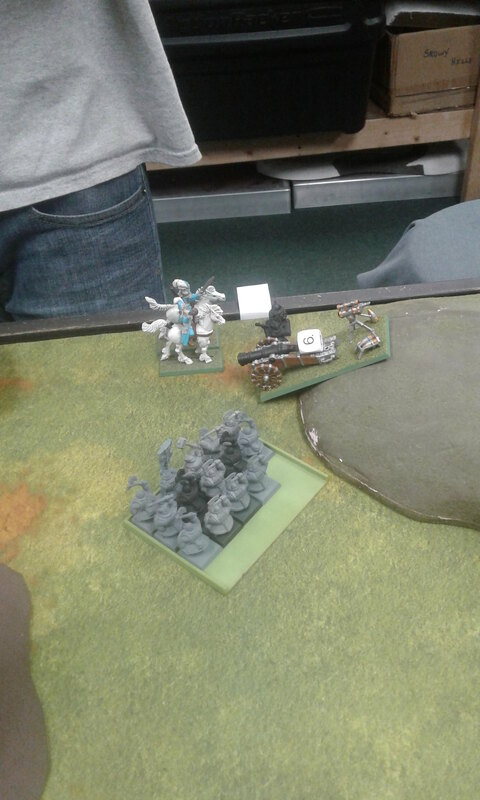 Not much was left to face me, but at the end it came down to me not being able to fling that Chariot through the Thunderers to get that one unit I needed across the edge. Just also noticed that Ashley forgot that Reavers were Special in the 6th Ed. book. Army is a touch illegal. I find your use of the chariots unusual- I like them in my O&G army, but don't use them by themselves. 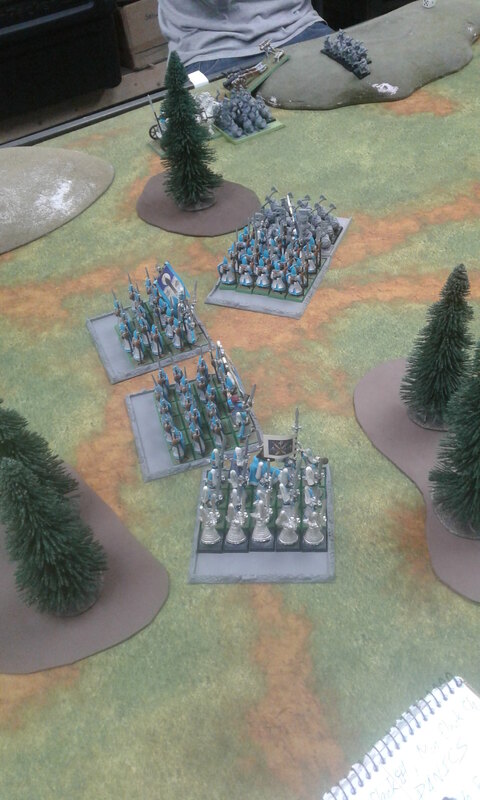 Their movement lets them keep pace with infantry and charge in support- a combination of chariot's damage and the infantry ranks is pretty brutal. If the opportunity presents itself they can charge out further, but generally you'll see what happened here- unless very lucky a chariot won't break a unit on the charge, and then it's doomed. With such an infantry heavy army in a 'fast' scenario I had assumed this was your plan. I assume your friend didn't know about the 'S7+ instant kill' for chariots? I'd have thought they (or your silver helms) would have been his prime targets. Yeah, it's been a while since my brother gamed religiously. He also didn't know Chariots can't march. I am of the mind I'd rather have more ranked units than Chariots, honestly. If I need fast flankers, there are better options. Essentially I view them as a point sink when another unit of Silver Helms would have been a better purchase. But we ran the models we had, AND he was the one that made my list. Silver helms can bust through units by themselves, but chariots are better infantry support (needing less frontage to do good damage, making joint charges easier). Chariots are also quite a bit cheaper than the Silver Helms. The fact that they will never hold their own, are always a gamble with impact hits, and can literally fall apart to one big hit are big negatives though. Overall, I like them and like the concept, but they're not the easiest things to use- and they really weren't the best for this scenario. And that's the thing, this scenario REALLY needed a thinner footprint, OR needed spamming of the Chariots. 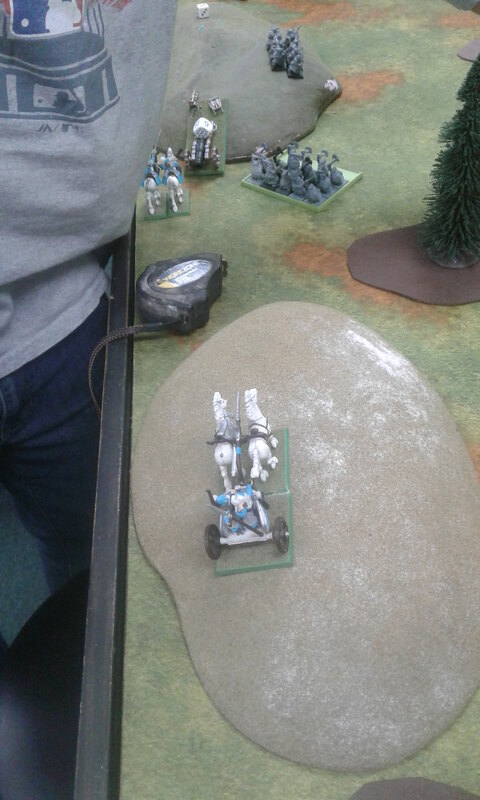 Three chariots hitting a unit side by side would have broken through no problem, honestly. One thing I DID neglect to point out line by line was the fact that I had a few Panic moments that were completely nullified by the scenario rules. A discussion I was having on how broken the massive number of Longbeards the 6.5 book could run sort of presented itself in this game. I know that Dwarfs don't fail LD very often, but it DOES still happen, and nullifying that to create a front line incomparable to any other army at the time is still a massively unbalanced thing to do. If you play to the strengths of the 6.5 book it becomes quickly apparent how different it is from the 6 book. Playing this battle with all the autopassed Panic checks and the ones I failed showed me that even if it only affects the game a little, it still affects the game. It's like storm bolters into a Dark Eldar Raider. Yeah, it's going to take a LOT of 6's in a row to blow that thing up, but it happens, and the more shots you have, the more likely it WILL happen. I've been playing vs the 6th book for a while, and they're pretty bad. lol I have yet to lose to dwarfs at all, so I might just allow him to go 6.5, the only thing i don't like is the anvil in 6.5, after re-reading it over, i like it even less. auto hitting 2d6 str4 on three units every turn is beyond bs compared to anything else in the shooting phase, but he does face against my tomb kings often enough (a friend has claimed that army as his own for play) Him getting 7 dispel dice on top of that is crap too since he can shut down my magic but i can't his (even in the description for the anvil it calls it magic) But he hasn't even built his anvil yet, so i don't see him fielding it anytime soon.